With a sad heart we would like to announce that R. Elaine Maerz passed away suddenly in her home in Turner Valley, AB on January 30, 2019 at the age of 73 years. She was born Jan 14, 1946 to Gordon and Florabelle Andrews in Turner Valley, and was raised in the Hartell area. She was married in 1965 to Don Maerz and they had two children which Elaine cherished, David Maerz (Heather) and Lora Hinman (Dave). Elaine was blessed with two Grandsons with whom she loved, AJ Hinman and Jordon Maerz. Elaine has three surviving brothers, Dale, Mel and Ernie and was predeceased by 4 sisters and 3 brothers. 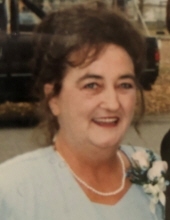 Elaine was a homemaker who enjoyed her time cooking and caring for her children. Please donate to the Heart and Stroke Foundation in lieu of flowers or gifts. To send flowers or a remembrance gift to the family of Elaine Maerz (Turner Valley), please visit our Tribute Store. "Email Address" would like to share the life celebration of Elaine Maerz (Turner Valley). Click on the "link" to go to share a favorite memory or leave a condolence message for the family.